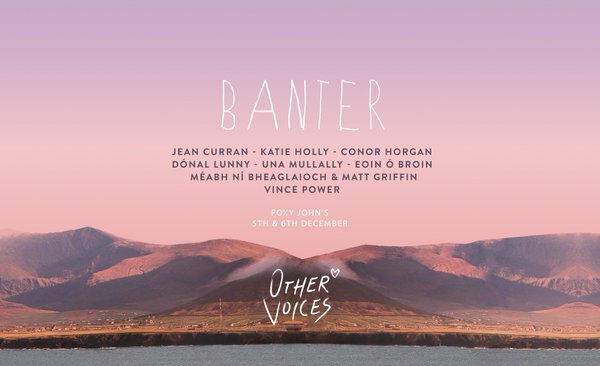 The Banter roadshow heads to the Kingdom for Other Voices on Saturday and Sunday December 5 and 6. It’s our fourth year in a row to take over the back of Foxy John’s pub in downtown Dingle for the weekend and we thank them and all at Other Voices for their patience so far. This will, I promise, be the year when we buy a pound of nails. And a new hammer. As always, we have a great cast of characters for you to meet over the weekend with interviews and discussions about music, politics, photography, war, media, activism and film-making (some more guests to be added too). The list of acts associated with this master musician reads like a history of Irish music. Since the late 1960s, Dónal has played a pivotal role in the development and evolution of the Irish sound through his time with the likes of Planxty, The Bothy Band, Moving Hearts, Mozaik, LAPD and dozens, probably hundreds, of other collaborations, projects, releases and tours. He continues to be as prolific today as he ever was, both as a solo artist and with groups like Usher’s Island. We think it’s high time to salute the legacy of this great musician and we’re honoured that he has agreed to join us in Dingle. Una is no stranger to Banter or Other Voices – indeed, she has appeared on more Banter panels and discussions than anyone else to date – but she’s here this time to talk about herself and an extraordinary year. In 2015, the journalist, broadcaster, activist and author has been centrestage with her excellent history of the movement for marriage equality in Ireland, In the Name of Love, her role in this year’s referendum and her strong, resonant, deeply personal opinion pieces on cancer. We talk to her about all of this and much more. Eoin is a Sinn Féin councillor with South Dublin County Council and a party strategist. Ahead of the 2016 general election, Eoin joins us at Banter to talk about the rise of Sinn Féin as a political force, the party’s strengths and weaknesses, his views on the Irish left movement’s political fortunes, the changing nature of Irish activism and his insights on what will come next for the party. Sunday Business Post arts editor and presenter of TXFM’s Songs In the Key of Life show Nadine O’Regan joins us by the fire at Foxy John’s to review the books, films, music and #WakingtheFeminists movement of the last 12 months. Meet the team behind The Queen of Ireland, the documentary film about Rory O’Neill, better known as Panti Bliss, in the lead-up to this year’s referendum on marriage equality. Director Conor and producer Katie join us at Banter in Dingle to talk about the motivation and process behind the critically acclaimed story about one of the stories of the year. There will be also be music at Banter over the weekend from some fantastic acts namely Saint Sister, Slow Moving Clouds, Hare Squead, Sample Answer and, as has become the tradition at Banter in Dingle, some local trad maestros in the shape of Méabh Ní Bheaglaioch and Matt Griffin whose new album “Cuisle” is out now.